Amsterdam, Holland’s capital, is one of the cities that demonstrates that Holland is among the culinary cream of the crop. It boasts three restaurants with two Michelin stars and countless one-star restaurants, making it a wonderful destination for lovers of the culinary arts! Discover the ten best restaurants in Amsterdam with one or more Michelin stars. Amsterdam boasts three restaurants with two Michelin stars: &samhoud places and Bord’eu. Let culinary Amsterdam surprise you! The beautiful Okura hotel literally allows you to dine at the top. Chef Onno Kokmeijer serves the most innovative creations with pure ingredients at an altitude of 78 metres, offering a wonderful view of Amsterdam. &moshik places can be found in a convenient centralised location near Amsterdam Central Station. The view is wonderful and the interior attractively sober. Of course the food itself is what draws you there most: unique combinations of innovative dishes served with the best of wines. Truly sublime! This stylish restaurant is located in the monumental Hotel de l’Europe and grants a wide view of the Amstel river. Chef Richard van Oostenbrugge serves his most exclusive creations in fitting surroundings. Bolenius serves wonderful dishes with vegetables from the restaurant's own garden on the Amsterdam Zuidas. 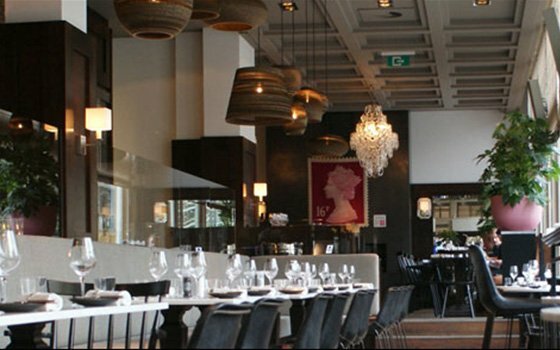 Restaurant Bolenius is the flagship of the Dutch Cuisine movement, which aims to promote Dutch cuisine and food culture. Traditional French schooling with roots deeply embedded in the North Holland polders. Chef Rogier van Dam represents simplicity and tradition without being afraid of innovation. A dashing combination! RIJKS® continues the themes of the Rijksmuseum: quality, authenticity, unicity, translated to the kitchen, the chefs, the interior and the location. RIJKS® is the Rijksmuseum on your plate. In this restaurant on Prins Hendrikkade, chef Christopher Naylor prepares the purest and most surprising dishes for you in an informal atmosphere. Dream of being in serene Japan and enjoy kaiseki ryori or multiple courses of Japanese haute cuisine. The waitresses in their kimono complete the Japanese décor. Ron Blaauw exchanged his two-star restaurant for an entirely new concept: Ron’s Gastrobar. Here, he serves small dishes (at a fair price) of top quality accompanied by the best wines. And he has once again earned a Michelin star. At the trendy Dylan hotel on Keizersgracht chef Dennis Kuipers creates classical French dishes with a personal, contemporary twist. Exciting and refined!